A newly repackaged paperback edition of the bestselling cookbook from the influential Paleo lifestyle bloggers and authors of Paleo Comfort Foods, featuring 100 Paleo recipes that are easy, healthy, and irresistible. With a foreword by Robb Wolf.The wildly popular Paleo movement is going strong, with millions of people enjoying the healthy, fat-trimming benefits that come with eliminating gluten, legumes, and dairy from their diets. 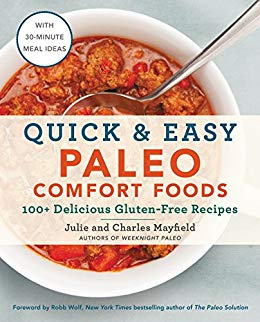 In this gorgeous cookbook, Paleo pioneers Julie and Charles Mayfield have gathered an impressive selection of palate-pleasing, timesaving Paleo recipes that are not only nutritious and delicious, but quick and easy to prepare. Packed with delicious ideas for starters and snacks, soups, stews, and salads, main dishes, sauces and sides, and sweets and treats, Quick & Easy Paleo Comfort Foods includes tips and recipes to help you transform favorite dishes and go-to comfort foods into healthy, gluten-free meals every day.